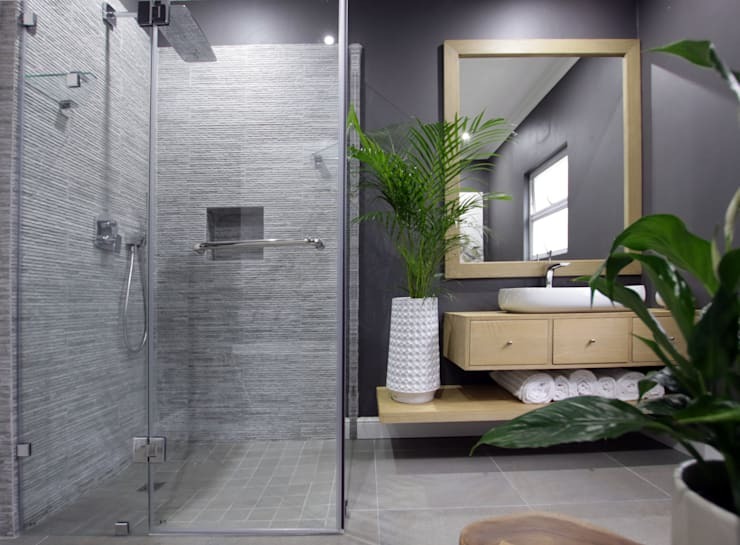 Even though there are numerous ways in which to style up a bathroom (ranging from the quick-and-cheap to more-intricate-and-expensive alternatives), few things come close to gorgeous shower tiles. Available in an array of shapes, sizes, materials and styles, shower tiles can instantly grab attention upon entering the bathroom – you don’t even need to be in the shower to appreciate them! That’s why we thought we’d take a look at some of our favourite shower designs (conjured up by some of the most professional bathroom designers) and their accompanying tiles to inspire you. Maybe you’re in the mood to switch up your bathroom’s look, or perhaps you didn’t even know a bathroom transformation was needed until you came across these exquisite designs! It’s those tiny, intricate wall tiles cladding the vertical surfaces of this shower that really catches the eye, even more so because they contrast so beautifully from the rest of the bathroom. 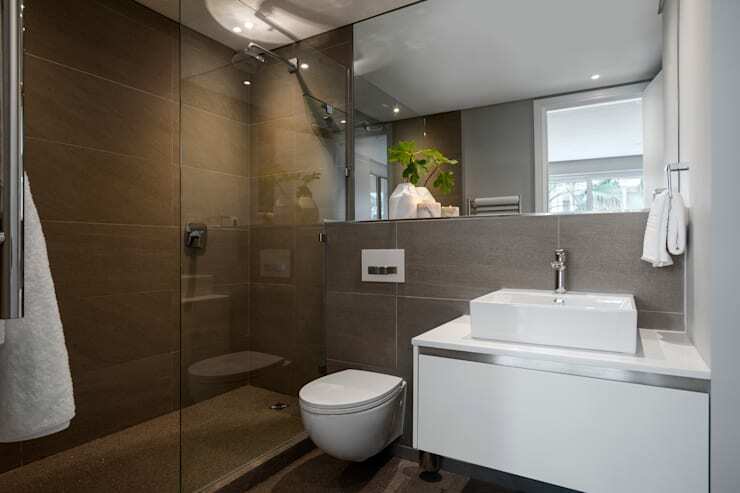 Notice how the shower enjoys a softer, more subdued look thanks to its colour palette. Combining different tile designs in one space can have quite the tasteful impact, but bear in mind not to go overboard with too many textures, patterns or colours. 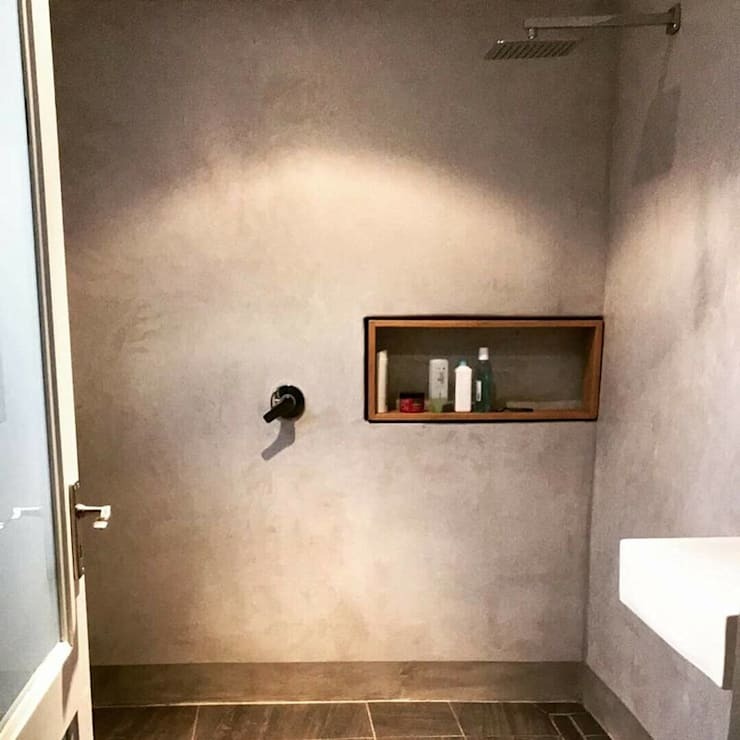 We love how these clean and classic shower tiles ensure a graceful look for the shower space, while the bathing area enjoys a slightly more rustic look via those stone surfaces! Fortunately neutrals are not our only option for shower tiles, as every imaginable colour is possible! See how this dusty mint green is a touch more prominent than the surrounding off-white and charcoal tints, and how it cleverly links up with the nature-inspired wall art. There’s something about oversized tiles (whether it’s for walls or the floor) that lends an elegant look to a space, clearly evidenced by this modern design in a mocha brown tint. Want to ensure a slip-free floor? We recommend these pebble shower tiles, which have come a long way and are still trendy in certain designs, especially rustic and country styles. For a surface that flaunts a bit of shine, you can’t go wrong with glass shower tiles. 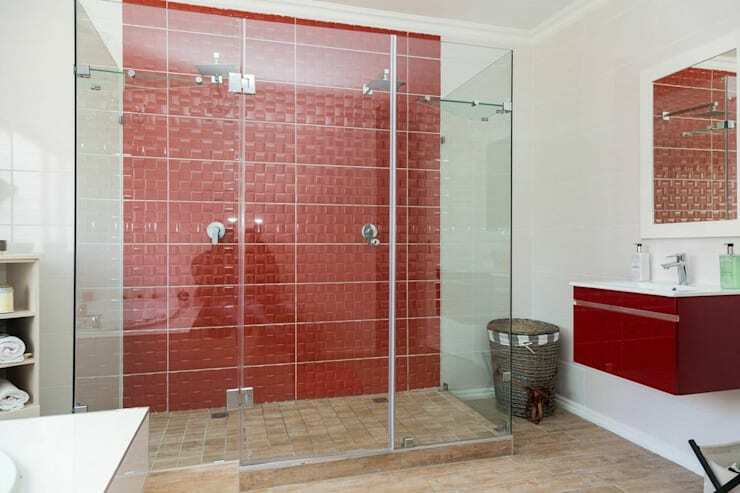 See how these ones, in a striking apple red, lend a bit of glimmer to this modern walk-in shower. And how that rusty red visually links up with the floating vanity? Pure genius! Subway tiles are quite the practical option, as they can be used in a variety of styles (from modern and industrial to contemporary and classic). 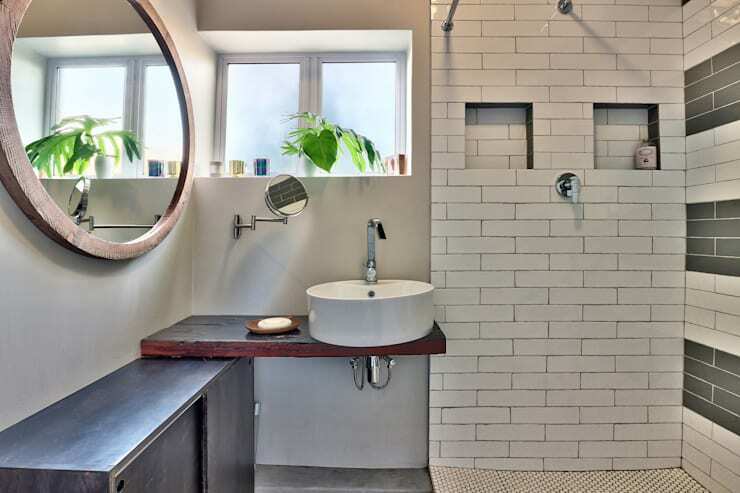 And if you want your low-ceiling bathroom to look slightly higher, opt for eye-trickery – switch those subway tiles vertically to make your walls appear higher! Even though we don’t want to go back to those avo-green bathrooms of the 1970s, there’s nothing wrong with a bit of retro. These square ceramic shower tiles are perfect for a bit of nostalgia, ensuring pattern (yet not too much) for a bathroom that wants to be somewhere in-between modern and vintage. When it comes to stone tiles, versatility is the keyword! Just think about all the different spaces where they can be used: house façades, kitchen walls, garden fences and, obviously, showers! Perfect for a look that wants to flaunt a slightly rustic vibe, but which is also clearly committed to a graceful design. Concrete surfaces are perfectly subtle, yet also ensure a delicate amount of texture and varying hues for visual interest. 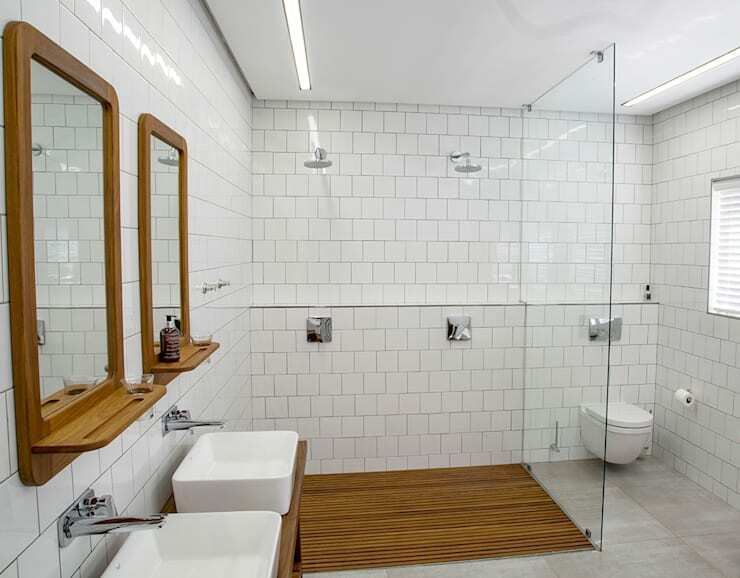 To ensure your concrete shower isn’t too monotonous, opt for more detail on the floor, like these oversized shower tiles! 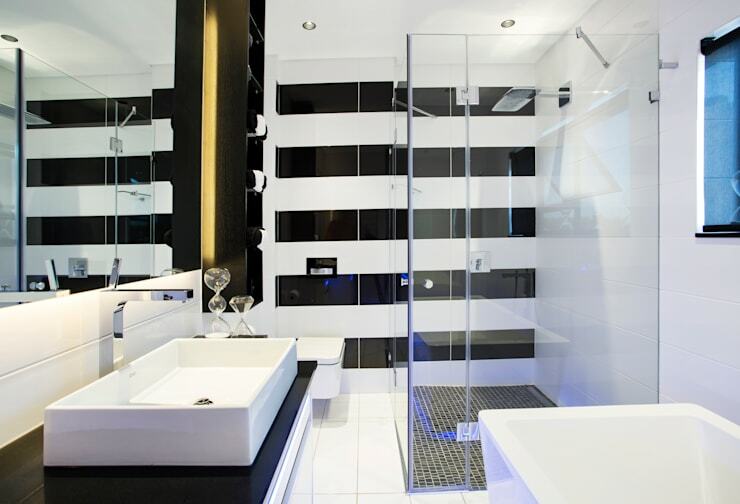 The king and queen of colour contrast, black and white always ensures a timeless vibe and a cutting-edge look, even for a simple little shower space. 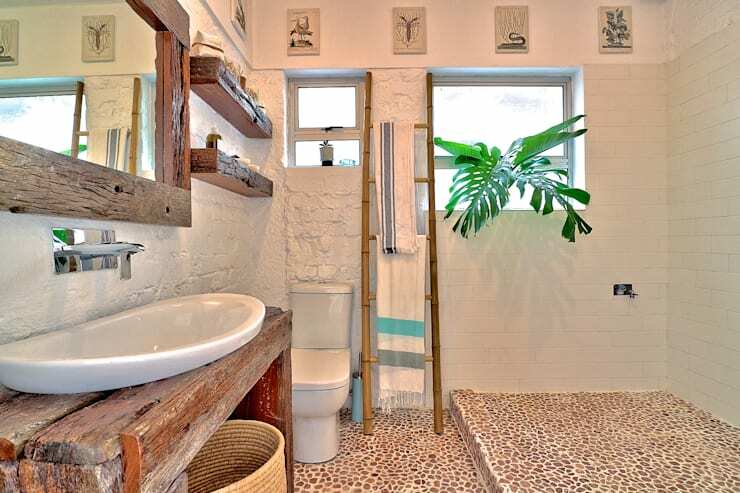 Notice how these shower tiles (the oversized wall ones and the tiny little tiles adorning the floor) share the same colour scheme, neatly tying the look together without going overboard with patterns and/or textures. 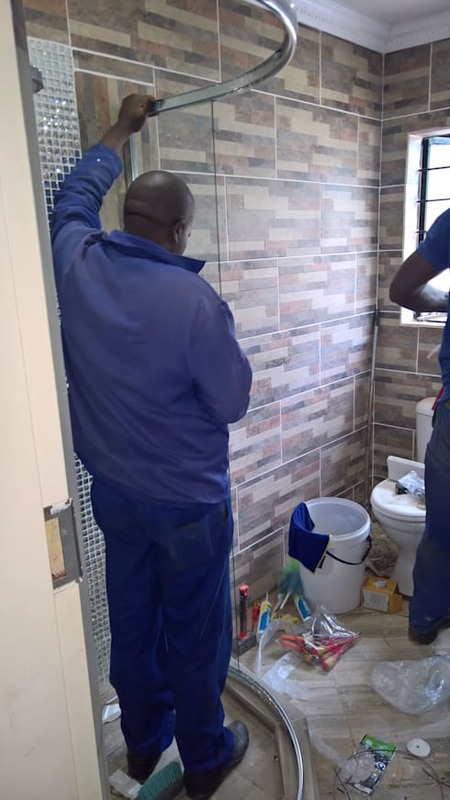 Need to have your shower tiled by seasoned experts who can offer not only top-quality results but also a variety of tile designs? Look no further than Kgodisho Solutions and Projects. 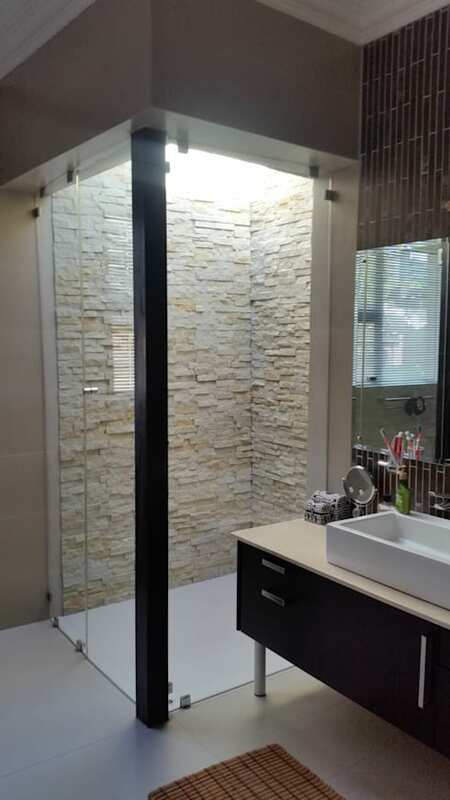 Based in Pretoria, this construction company specialises in building and renovations, but also undertake any form of alteration, extension and exterior/interior construction. 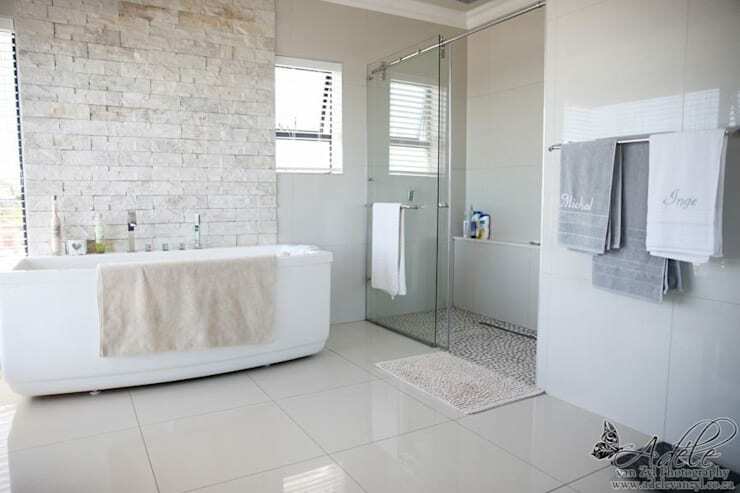 In addition to providing you with top-notch shower tiles, they can also be counted on for bathroom designs, painting, ceilings, kitchen makeovers, plastering, plumbing, and a range of other services. Don’t forget to take a look at homify’s hottest tile trends for 2019. 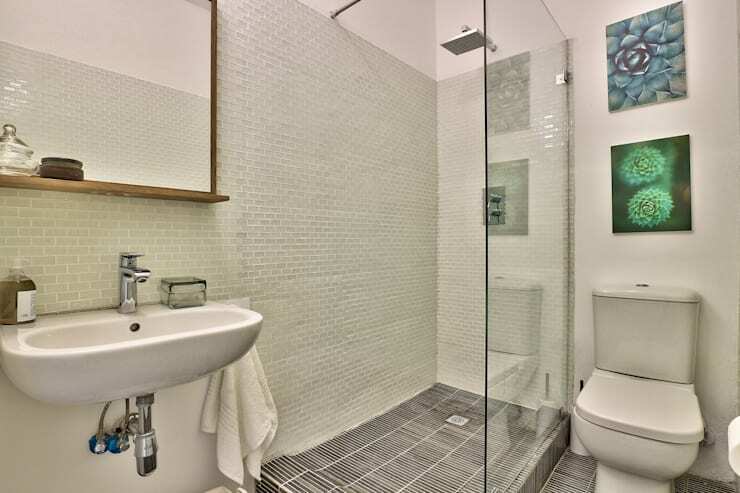 Which of these shower tile designs would you pick for your bathroom?